We travelled in January for 2 weeks over new years eve, we were a large group of mainly family and a few friends aging from 17 to 60, looking for a lively Cuban holiday! We got off to a bad start when our plane landed in holguin for 3 hours, we were not told it would! When you have had a long plane journey and you have to sit in the scorching heat, it isn't pleasant, all you want to do is get to your accommodation! Especially as we travelled new years eve and was hopping to get to the hotel in time for the banquet! Make sure you ask if it is a direct flight, as they wont tell you otherwise! When we finally got to our hotel, it looked adequate but no where near the standard of our previous hotel, we were told it was 4 star but, it wasnt. The rooms were very outdated, not luxurious at all, however, not dirty, the walls were thick with old, covered over paint and a bit scruffy. We paid alot of money for this holiday, and writing as one of the younger members of this group, was very disappointed. It became so boring on a night time, we were all in bed by 10pm if not earlier. It was only into the second week we decided to take taxi to our previous hotel, just 5 Min's away, where we spent most of the holiday nights for a small fee, but worth it. We also occupied ourselves with trips and excursions which kept our holiday alive. Overall, the hotel was adequate, if i hadn't have paid alot of money and had such high expectations set by our previous hotel,(playa almera) i would have been OK with the hotel, but i cant say i was. In the first day we were considering moving as we were all that disappointed. It was an enjoyable holiday, made by our company, but it did certainly not live up to our expectations, and we are def. Not snobs! Just looking for value for money! All I'm saying is that there are definitely better hotels out there, so choose carefully! 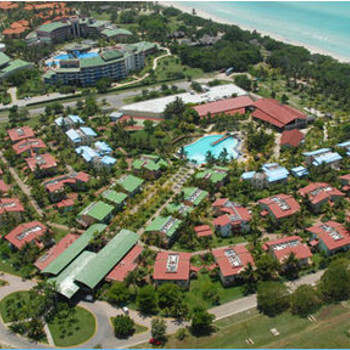 Top tip- the further up the varadero peninsula you go (away from varadero) the better the hotel. We were in the 1st third. Just returned from one weeks stay at the Riu Turquesa. Basically had a fabulous time! All the hotel staff are both friendly and helpful and go out of their way to make things easy for you. It is a long flight for 1 weeks stay and prior to our departure I was a little concerned about this with 2 young kids, but it was absolutely fine. Once on the bus to the hotel its about 30 minutes and check in at the hotel was very swift. The rooms within the hotel grounds are in blocks. They are a little basic but clean and comfortable and it is nice to walk in to an air conditioned room when you have been out in that hot Cuban sun. The beach is accessible from a path within the hotel and it is just beautiful. Powder white sand and turquoise blue sea. You can take a pedalo out free of charge and there is a man waiting to find you a sun bed also free of charge. During our stay we went to see the Dolphin show, just a short walk away, where you can also swim with them, this was definitely worth a visit. We also took a bus into Varadero. It is by no means a touristy place but it was nice to see something different. The food wasn't brilliant, but it was ok, we soon adjusted! We saw a couple of nice shows during the evening entertainment, but apart from those and the kids mini disco time that was about it. Was not a problem though as the kids were worn out most evenings anyway with swimming, snooker and kids activities they had done during the day. We all thoroughly enjoyed our holiday and would visit Cuba again for 2 weeks though next time and would probably go to a four star hotel just for a bit more choice at meal times. It is in a good location on an excellent stretch of beach. The hotel grounds are well maintained and the rooms are fairly large if a bit old/tired - they need a bit of a refurbishment but are very clean. The entertainment team (if you can call them that) are no-where to be seen in the day ...and only did 2 shows in the week we were there other than that its dance competitions, Mr and then Miss Turquesa with the guests providing the entertainment or there's always BINGO ! There are no diet drinks or brand names soft drinks. Me and my partner both 25 have just returned from a great stay at the Riu Turquesa! The rooms were pretty basic but they had everything you needed safe, fridge, air con, TV (which had quite a few English channels), hot shower and the beds where comfortable. My wife and I stayed at the Riu Turquesa in 2004 October. What a pleasant surprise we loved it. The rooms were very modest but clean with a lovely little balcony we sat out in the morning and night. Loved the grounds very well kept. The maids were lovely ladies leaving animated designs out of towels every morning. The restaurant was very clean the meals were buffet style lots to choose from...the staff were absolutley wonderful. Can't say enough about them. Just a very enjoyable place to vacation. The best for last. The "beach out of this world:..the Cuban people are wonderful no matter were you go. We will be returning this October 15 again so look forward to seeing you there ..believe me you'll love the resort they try to make your stay a wonderful experience. The hotel is generally great but the food is disappointing. We have been to other RIU hotels and this one had the worst food. This is mainly due to the fact that deliveries to Cuba are few and far between so things can run short. Those who are expecting fresh tropical fruits and fish will be disappointed as these items are very limited. The food that is there is of a very high standard and the chefs try to make everything look as pretty as possible. The rest of the hotel is lovely. The rooms are large and immaculate. Ours was in a block of four which meant that we had a large veranda with sunbeds and it was extremely quiet. You also get a minibar in your romm which is restocked every other day. The RIU is surrounded by larger hotels which have a choice of restaurants and better facilities but this hotel is extremely friendly and for those not wanting crowds of people it is a better choice. The entertainment team are great and will do almost anything to get you involved in the activities. We are pool rather than beach people and had no problem in getting sunbeds every day. The hotel provided beach towels and the lady in the towel hut has her own small library of books which you are free to borrow.